Two Viberti brothers currently run their family’s farm in La Morra, one of the villages in the commune of Barolo. Their great-grandfather established the farm in 1928 and farmed cereals, fruits, and nuts, until about 25 years ago when the family began to work with grape vines. Today they have small vineyard parcels scattered across the neighboring hillsides, and produce four Barolos, as well as a handful of other wines based on local varieties. 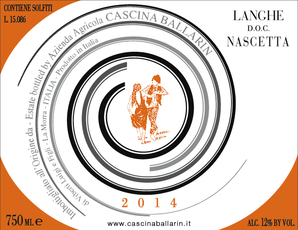 This white wine is made of nascetta, a local white variety native to this corner of the Piedmont. In the 19th century, nascetta was well-loved and widely planted; but after phylloxera, it nearly went extinct from lack of planting. The variety was resurrected in 1991 by a local winemaker, and today about a dozen producers in the region produce a Langhe DOC pure nascetta. The Vibertis make theirs in stainless steel, keeping this naturally structured grape extra crisp and fresh tasting. Pair with a mild Piedmont cheese, like Robiola Tre Latte, or any springtime pasta dishes. We often find ourselves singing the unending praises of rieslings from the steep, slate heavy hillsides of the central part of Germany's Mosel river. But if you head upstream (west), towards Luxemburg and the Saar and Ruwer tributaries, the soil changes drastically, and the wines do too. In the lesser-explored “Upper Mosel” hides Germany's best-kept secret, one of the oldest white grape varieties in the world, and what could be accurately be called Germany’s Muscadet: ELBLING. The Upper Mosel’s soils are limestone-heavy, which through elbling translates to chalky, mouthwatering acidity and spine-tickling verve. Matthias Hild's dry bottling is a great introduction to the grape, full of lemony herbaceous notes and a delightfully tart finish. Perhaps shuck yourself a few oysters to go along with this one. Six generations of Carrels have farmed this family estate, situated in the central part of the Savoie, high up in the French Alps. The Jongieux vineyard sits on slopes overlooking Lake Bourget, one of the biggest lakes in France, which has been directed via artificial canal into the Rhone river. The hillside protects the vines, which face south and south west, and the large lake helps moderate the weather, making a fantastic microclimate for growing grapes. In addition to their white and red wines, the family also makes this charming rose made of 80% gamay and 20% mondeuse. Snappy and bright, with fresh berry fruit supported by characteristic Savoie minerality, pair this rosé with light fish or shellfish, or just drink it alone on the next sunny day we have! 2014 Domaine de Bellevue "La Galoche"
Raphael Saint Cyr is the fourth generation vigneron at the Domaine de Bellevue, which was created by his great-grandfather Pierre Saint Cyr in Anse at the southern edge of the Beaujolais. When Raphael took over the winemaking in 2008, he let go of a large portion of village-level vines around the winery, and acquired vines further north in the crus of Morgon, Regnié, Chénas, and Moulin-à-Vent. At the same time, he converted the entire 23 hectare domaine to organic viticulture, making Domaine de Bellevue the largest certified organic domaine in the Beaujolais. Unusual for the region, the crus are all single vineyard parcels, and the name of each terroir is listed with each wine. They are fermented in concrete tanks and then aged in used barrels for 12-18 months. 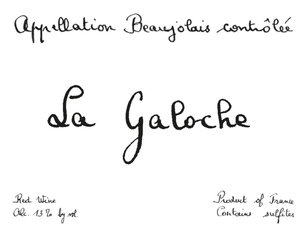 La Galoche, the straight Beaujolais cuvée, is aged for 6 months in concrete tanks. All of the wines are vinified with natural yeasts. The Grati family, with patriarch Grato at the helm, is one of the last in Chianti Rufina to age their Riservas in large oak botti. Why does this matter? The move to smaller barrels over the last few decades was in the aim of replicating textures found in wines from Bordeaux or Burgundy, as increased surface contact with oak encourages oxygenation. Older barrels provide a more reductive (opposite of oxidative) environment, which slows the development of the wine. Whereas wines aged in barriques or tonneaux might produce more fruit-forward wines upon release, young wines from bigger, older barrels are often green and unforgiving, but would reward patient cellaring. This preference toward the old ways of winemaking is systemic throughout Villa di Vetrice, which might prevent them from being the darlings of the press, but there's no questioning their authenticity. Bearing the weight and savor of a typical Riserva, try this one with rabbit and morels. 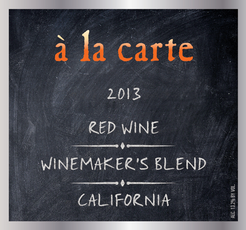 2014 Brack Mountain "à la carte"
We keep gravitating toward these odd Californian blends, mostly because of the increased difficulty in finding affordable, drinkable cabernet or pinot noir. This one is a blend of zinfandel and carignan purchased from a single vineyard in the Russian River Valley and dolcetto from one in Dry Creek. It weighs in at a perfectly reasonable 13.3% abv, and tastes like grapes grown in California, not like oak chips or mega-purple. Heck, you could even pair this with burgers, spaghetti, pizza... you know, food!